Though a common infection, Periodontitis is a serious dental health concern that could result in tooth loss. If left untreated, periodontitis can even increase one’s risk of stroke and heart attack. In both instances, it begins with inflammation around the tooth, which is the translation of periodontitis, as explained by Medical News Today. For example, microorganisms found in plaque and bacteria stick to the surfaces of teeth and gums. As they multiply, the immune system releases toxins and inflammation occurs. Even so, the good news regarding periodontitis is that it is preventable, and there are treatments to help individuals obtain good oral health again. As one can imagine, the primary goal of treatment, when it comes to periodontitis, is to thoroughly clean teeth and the pockets of gums. This is done in an effort to prevent further damage to the alveolar bone. Depending on the severity of gum disease, a scaling treatment might be used to clean below the gum line and smooth out rough patches on the roots of teeth. 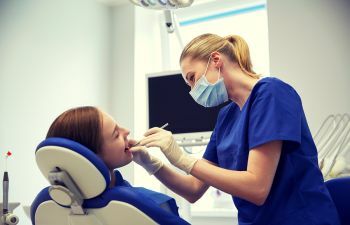 As dentists help patients regain their periodontal health, an antimicrobial mouth rinse might be prescribed to keep bacteria at bay. Other options include an antibiotic gel, enzyme suppressant and oral antibiotics. It’s important for patients to understand that once they have periodontitis, they are at risk for it to reoccur. Thus, a commitment to better oral care is imperative. When non-surgical treatments are not effective, or when gum disease is advanced, there are surgical treatments designed to reposition gum tissues against teeth. One example is flap surgery, in which tartar is removed within the deep pockets of gums, and the gums are sutured firmly next to teeth. In another case, a bone graft may be performed to regenerate bone that has been damaged or depleted. Finally, a soft tissue graft is a process whereby tissue from another area of the body (or synthetic tissue) is used to cover the roots of a tooth that have become exposed. At Alora Dentistry, we understand the implications of periodontitis and advanced gum disease. That’s why our team is committed to helping patients avoid tooth loss and other consequences with experienced periodontal therapy. Take the step towards better dental health by calling Alora Dentistry today.